Noodles in Lemon Sauce (for One) | What Smells So Good? With school back in full swing (and my new role as Home Economics teacher filling my off hours with lesson planning and recipe testing), fast and simple meals are definitely on the menu more often than not. I love Chinese (well Chinese-American) style food, but it's been ages since I've been able to have takeout from anywhere - not a bad thing, really, since my wallet and my health are better for it! Stir fries are the quintessential backbone of most of those dishes anyway, and given that they are so fast and simple to whip up a la minute it's only natural that meals like this one have graced my plate multiple times a week. I actually started coming up with this combination of flavours when I had an unusual craving for lemon-sauce chicken. Now, I've never liked lemon chicken from the Chinese take-out place, but for some reason that sticky, thick and tangy-sweet dipping sauce was running through my mind. I was also craving a big bowl of veggies and carbs (what else is new?) so I decided to try combining the two for a simple dinner. The sauce was really the catch-all for a host of flavourful ingredients - fresh lemons, tamari, garlic, chilies and ginger, plus a healthy pinch of a premade Nanami Togarashi mixture were all sweetened a touch with stevia and thickened with tapioca starch. 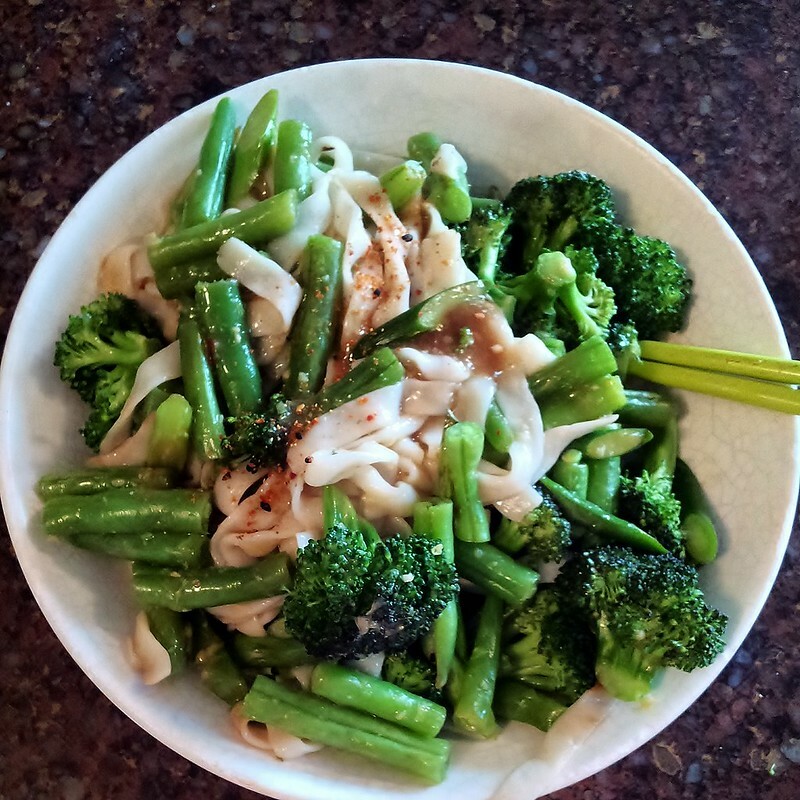 It cloaked the brown rice noodles, broccoli and beans delicately without the gluey cloying nature of it's takeout inspiration and was the perfect hit of exoticism for a mid-week, run-off-your-feet meal. Blend juice, tapioca starch, broth, soy sauce, stevia, lemon zest, chilli flakes, togarashi and garlic. Set aside. In a small amount of water in a wok or saute pan, cook beans and broccoli until just crisp-tender. Pour in the lemon sauce and noodles. *Togarashi, the Japanese word for “chilies,” is a group of condiments always including chilies that bring out the clean, simple flavors of Japanese food. Shichimi togarashi is also called seven spice (shichi is “seven” in Japanese), because seven ingredients are generally used. Nanami togarashi is a close cousin, with a slightly different proportion of ingredients emphasizing citrus zest. If you don't have it, substitute a pinch of cayenne, a dash of black pepper and a few grates of lemon or orange zest.